As my husband begins to prepare for retirement, we have been talking a lot about where we want to live. Staying in our house, much as we have loved it for the past 31 years, is not the best option. First of all, at some point the 2 1/2 stories will be too much for us. The upkeep and maintenance are already more that we want to undertake, and the taxes and insurance here are killers. So...if you know you will want to/have to move, where do you go? While it is possible that we will remain in this state, we are exploring other options. We have eliminated places that are too hot, such as Florida, Arizona, and Texas, as well as states that are just too expensive such as California. We don't want to live any further north than we are now, but we still want to experience some of the four seasons. North Carolina and Tennessee have both made our initial short list. Last week we spent 7 days in North Carolina. Uncertain as to whether we would prefer lake or mountain views, I lined up an itinerary that offered some of both. We began in Charlotte for a number of reasons. 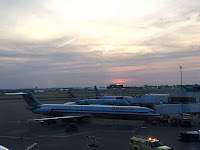 It has a wonderful international airport, which we always have to fly through when traveling abroad. Why not live there and eliminate one stop on foreign trips? Charlotte is a large city (population around 800,000) with many of the cultural institutions and activities we have grown to appreciate in our current hometown. With that comes great medical care, which will become more important as we age. We don't want to live right in Charlotte, but instead wanted to look at the six lakes that surround the area. After 2 days, we knew that none of these lakes were what we were looking for in terms of livability. They are located off of narrow, winding roads with no amenities nearby. I don't want to have to drive an hour to buy a loaf of bread, go to a store, or see a doctor. Our next destination was the town of Lenoir, located northwest of Charlotte at the foot of the Blue Ridge Mountains. On the way we found the two remaining covered bridges in the state of North Carolina. In Lenoir, a smaller artsy community, we stayed at the Irish Rose B&B. It was a huge, beautiful old home, and the proprietor made the most amazing breakfast that we have ever had at a B&B. The other guests we met were so interesting to talk to, and a couple from Maryland were on the same journey as us, so it was fun to compare notes. They were even looking at The Coves, a mountain gated community that we had come to see. Alas, with Lenoir being 1.5 hours from Asheville and 1.5 hours from Charlotte, we decided the distance was more that we would like to drive each time we want to fly somewhere. There were other reasons we dismissed this area as well, but the travel time to get to any cultural events or flights was a big one. Next up was the town of Black Mountain, which had a couple of gated communities we wanted to see. We had an appointment with a realtor, and she took us to several communities but also to a few regular residences that were up for sale. She wanted to give us an idea of what our budget could buy us in the area. I have to say, Black Mountain will probably remain on our short list. It is less than 30 minutes from Asheville, the community is darling, we could purchase a lot with mountain views and build our own home, and we could be on Lake Lure in 30 minutes if we wanted a lake experience for a day or weekend. After spending most of the day with the realtor, we drove to Lake Lure. I really wanted this area to work out as it is only about a half hour from Asheville, and the lake has wonderful mountain views so we could have the best of both worlds. Unfortunately the houses are very close together, which we are trying to avoid. Plus there are no shopping or medical facilities in the area. You would have to drive to Asheville for most things, on a winding road with a 35 miles per hour speed limit. 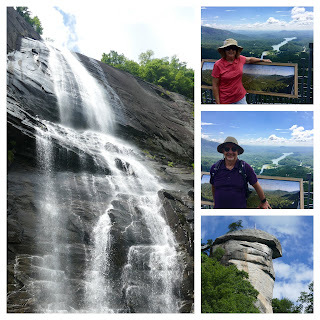 It was a pretty and fun place to visit though, so we had a good time playing tourist for a couple of days as we explored the lake and Chimney Rock State Park. 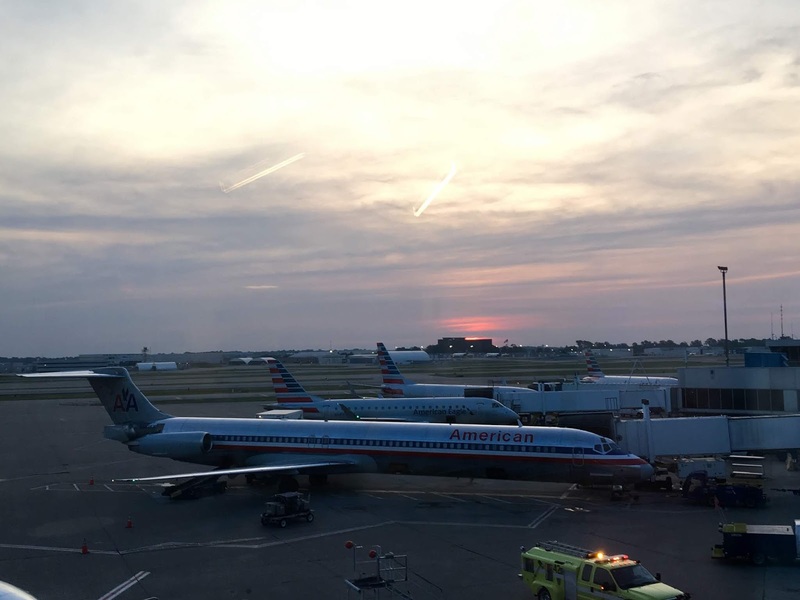 We worked our way back to Charlotte on Saturday because we had an early flight home Sunday morning. Though it wasn't exactly on our way, we made a second trip to Black Mountain so that we could see a little bit more of the town on our own. Despite the fact that it was a Saturday during tourist season, it wasn't too overrun with crowds, so that was good to see. If we decide to get more serious about settling in that town, I think we should go there for a couple weeks in the spring or fall and really get a feel for the area. At the end of the day, while we were a little disappointed that nothing called out to us, it was a good experience and we learned a lot from this trip. We will be better prepared for the next one. We are in no rush, and we want to take the time to make sure this next move won't be the wrong move. 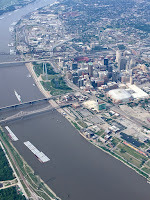 We have been in St. Louis for 40 years, so we obviously don't take relocation lightly! One of the projects designed by SWT Design is the Sculpture Garden in Webster Groves. 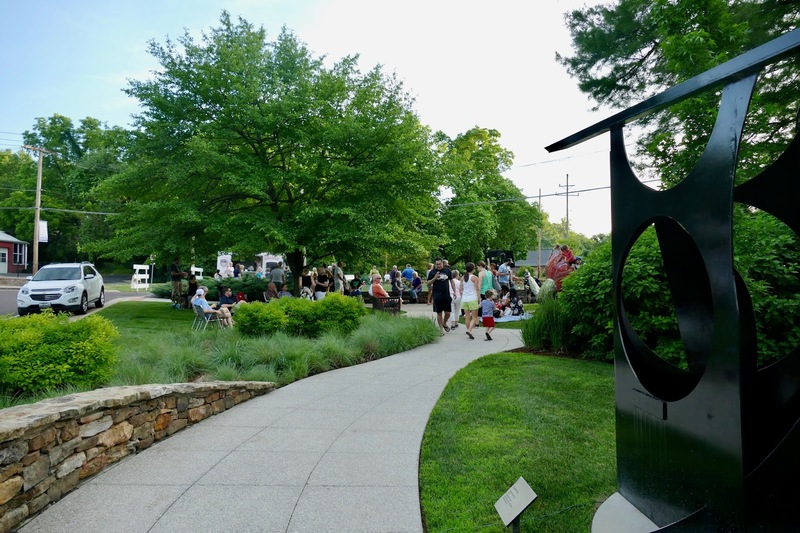 Located at the intersection of W. Kirkham and Gore Avenues, the once derelict area was transformed several years ago into a green oasis complete with multiple sculptures. A volunteer committee worked very hard with the City to develop a plan to light the garden, which culminated in a lighting ceremony Wednesday. Residents gathered to listened to a wonderful jazz group, chat and enjoy the treats offered by The Sweet Divine, winner of the Food Network's Cupcake Wars in 2012. Around 8:40 Mayor Gerry Welch threw the switch, and the area lit up to the applause of a delighted audience. It is such a lovely space! Saturday was the opening reception for the Women in Focus show entitled "Transportation". We were selected by the Kirkwood Arts Commission to have our exhibit hanging at the Kirkwood Train Station for the month of June. 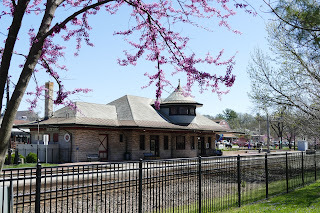 Built in 1893, the City of Kirkwood purchased the station from Amtrak in 2003 when the company decided it was no longer profitable to have a stop in that location. 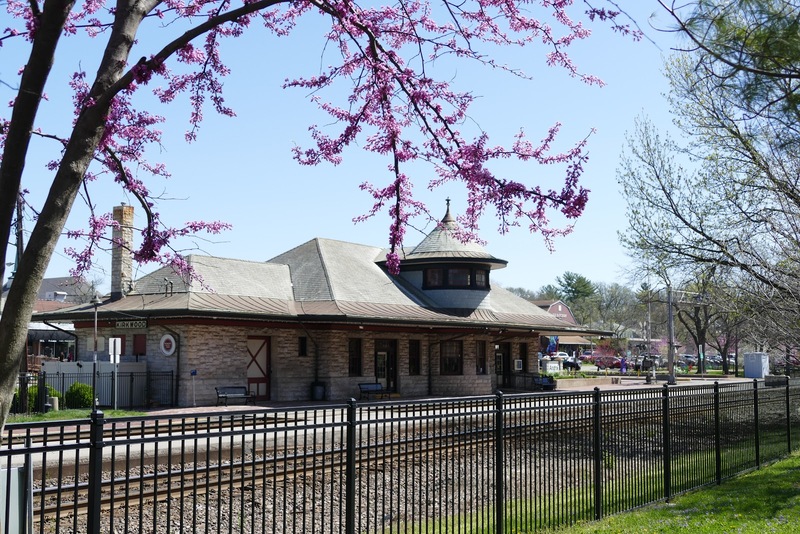 In a unique move, the City offered to staff the station with volunteers if Amtrak would continue to drop off and pick up passengers in Kirkwood. It has successfully operated as an Amtrak stop ever since. Because wall space is limited in the station, I only submitted one photo for the exhibit. Despite torrential downpours and some hail, we had a pretty nice turnout for the opening. Saturday evening we picked up some friends and went to Forest Park for the 40th annual Shakespeare in the Park Festival. This year's presentation was "Romeo & Juliet". The event is free, and you bring your own blankets and/or chairs and food and drinks. Or you can choose one of their reserved seats for a charge, and can also purchase food and drinks from their vendors. Due to the rain earlier in the day, the temperature had cooled down to the mid-70s and it was a pleasant evening to sit outside. While Shakespeare is not my thing, "Romeo & Juliet" is one of his plays that I do enjoy. But of course they had to change it up. The costumes looked like clothing for the 60s - as in 1960, not 1660. And the dialogue just didn't have the same cadence as expected. All of the Shakespeare productions I have seen over the past several years have had the same dramatical editing done to them. I understand artistic license, but I will just say that I am not a fan. While the show was quite good, I found myself wondering, "Shakespeare's Romeo, wherefore art thou, Romeo?" My one week follow up appointment for my second cataract removal was yesterday morning. When I woke up yesterday, my left eye was bothering me a bit. It sort of felt like something between a scratch and having something in my eye. The prescribed eye drops did nothing to alleviate the sensation. As I was heading to the doctor for my appointment, it seemed fortuitous that it began to bug me that morning. A check of my eyes revealed the eye pressure was 10 in the right eye and 11 in the left, both well within normal ranges. My vision has continued to improve, and in fact I could read the eye chart and the text sheet they handed me better with my left eye than with the right. At home I very rarely have to slip in reading glasses, so that is fantastic. Dr. Pepose said the left eye looked really good, but in light of my complaint he had the technician run dryness tests on both eyes. As both came back being too dry, he feels that the discomfort in my left eye is due to dryness. It is hard to fathom considering I am putting three drops in each eye three times a day, but there you have it. He suggested that I get an over the counter eye drop called Retaine. He also said that there is an ointment I can use in the eyes each night in case the day drops don't do the trick. Just what I need - more things to put in my eyes! Stopping at Schnucks, I found that they do not carry Retaine. After looking up the product online to see if I could substitute one of the other 30 brands of eye drops on their shelf, I found that Retaine has a proprietary ingredient that no one else has. Off I went to Walgreens to look for the elusive drops. Even there with the 60 brands of eye drops on the shelf, I had a hard time finding Retaine. After Googling it to see what it looks like, I saw that it comes in a square box with single-serving tubes inside, while I had been looking for a box that would contain a bottle. I finally located the drops, and was dismayed but not all together surprised to find that the price was $26.99 for the 30 drops. Yikes! No wonder a lot of older people don't take care of their eyes - it is so expensive to buy all the different kinds of drops you need! On the plus side since it was the first Tuesday of the month, the clerk asked if I was a senior as I could receive a 20% senior discount. Since their age requirement is 55, I'll take that as a compliment. Here's to senior discounts! I have used the drops a few times now, in both eyes as directed. The immediate relief in my eyes is great, but about 5 minutes later my left eye feels scratchy again. If the situation doesn't improve in a couple of days, then I'll go pick up some of the ointment to use at night. It seems odd to me that there was no problem until six days post-surgery. Maybe there is just something in the air as the allergens have been high lately. We'll see what happens - bah!